Key members of the Thai Royal family , on October 12, gathered at Siriraj Hospital in Bangkok where King Bhumibol Abdulyadej is receiving treatment, to pray for him. Crown Prince Vajiralongkorn has returned on an urgent flight from Munich to be with his family, including Queen Sirikit, Princess Maha Chakri Sirindhorn, Princess Chulabhorn, and Princess Ubolratana . Apart from the royal family, Thai Prime Minister Prayut Chan-o-cha cancelled trips to the eastern provinces of Chonburi and Rayong to present at the hospital. 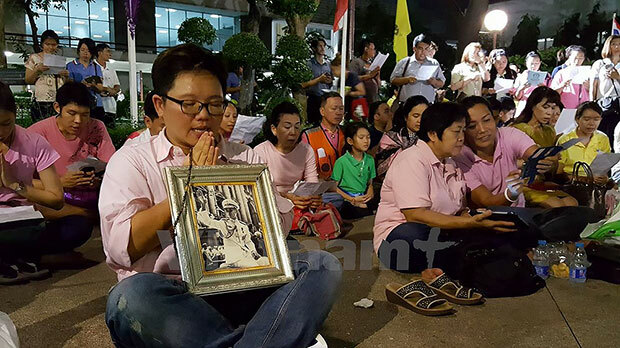 According to local media, more and more people have also flocked to Siriraj to pray for the king. On October 10, Royal Palace officials said the health of King Bhumibol Abdulyadej, one of the world’s longest-reigning monarchs, was in an unstable condition. At least two major events participated by royal members have been cancelled, including a graduation ceremony at the Chiang Mai University in late October and a royal event at Chitralada Palace slated for October 13 or 14. Earlier, the government urged people to be patient and not to listen to rumours on social media about the King’s health./.